Blogging is a serious business and only those who take it as such will succeed in the venture. You have probably heard that there is so much money to be made in blogging and that is true, but are you aware that there is so much work to be done? I'm not trying to scare you but just trying to lay the facts before you so that you will be able to make a better decision to succeed. Launching a blog definitely requires a domain name (e.g www.yourblog.com) and registering one may seem as easy as ABC but not really so. Why? A lot of juicy names have been taken! On the other hand, you can decide to launch your blog on a free platform like Blogger or WordPress, but you will get a sub-domain (e.g www.yourblog.freeplatform.com) and this is not good for online branding as well as customization. Consequently, I want to expose how you can register a .com domain name for free and host it effectively for optimum blogging experience. For you to be a successful blogger, there are basic things you need to do. You must carry out a thorough research on the keyword(s) you want to target. This is very important in order to be aware of the challenges ahead and prepare very well for them. Through your research, you will be able to discover the average monthly searches for your keywords on search engines (especially Google), level of competition, average click rates, popularity of a search term over a period of time, trending phrases and so on (read 'Top SEO Tools For A Profitable Website'). You will also need to choose a domain name for your blog and this is where it gets more serious. This is so because majority top names have been acquired. For example, if you will be blogging about 'wedding clothes', the most ideal name for you is 'weddingclothes.com' but I can bet it that the name is already registered. However, when you discover that the name you want to use has been registered already, there are proven ways of ensuring that you register your choice name or something close to it. You can choose other extensions (e.g .net, .biz, .org, etc.) if your choice extension (perhaps .com) is no longer available. You can also do a slight modification to the name in order to make it unique and pass the unavailability test. It is also possible to get the name of your choice by contacting the registrant and negotiate with him/her if he/she will be willing to sell the domain to you (read 'What You Can Do If Your Domain Name Is Taken'). 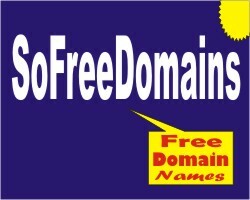 Since it is not a good idea to start a blog on a free platform, is it a good idea to register a free .com domain? Yes, it is! The .com domain extension is the most popular extension in the world with more than 115 million registration, far ahead other extensions like .net, .org, .biz, etc. As a result of this, the demand for it is very high which makes some people to speculate on domain names. They register names and keep them till those who need them for web development show up. The speculators now sell to the end-users at prices of their choices - in 2010, insurance.com was sold for $35.6 million. If you are lucky and your choice domain name is available (i.e yet to be registered), you can register it for free with a simple strategy and reduce the cost of starting your blog. What you need to do is to purchase a web hosting service for your blog from a reputable provider that offers free domains. There are different web hosting packages but as a blogger, it is advisable for you to choose a package that has enough file storage and bandwidth allocation because a blog is about contents and traffic. You should also look for a package that has features for easy installation of your choice free content management system (CMS) like WordPress, Drupal, Joomla, ect. There should also be a room for creation of considerable amount of sub-domains in case you want to create subordinate blogs or websites and this can go a long way in boosting your revenue.